Sétif (Arabic: سطيف Saṭīf, Latin: Sitifis) is a city in and capital of the Sétif Province in eastern Algeria. It was part of the ancient Berber kingdom of Numidia, and was a Roman colonia. 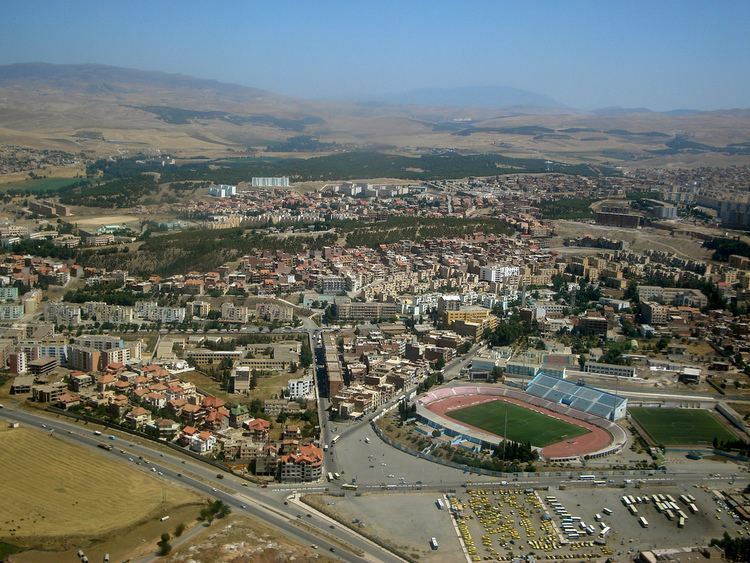 Sétif is the capital of Sétif Province and it has a population of 288,461 inhabitants as of the 2008 census. It is located to the east of Algiers and is the second most important wilaya after the country's capital. The area sits at 1,096 m (3,596 ft) above sea level, making it the second highest capital of a wilaya in Algeria. The streets are tree-lined with a fountain and theater, giving the town a French feel. The city is one of the coldest regions in Algeria, located 300 kilometers east of Algiers, 65 km from Bordj Bou Arreridj and 132 km from Constantine in the Hautes Plaines region south of Kabylia, the city is located 1100 meters above sea level, the city is connected by rail as well as the main national highway. It is a university town located approximately 190 miles east of Algiers on the highway to Constantine. The city lay in the region of the Numidian kingdom of Massaesyles. It was near Sétif that Jugurtha campaigned and lost against Marius in 105 BC. Overcome by Marius, he was taken to Rome where was executed in the prison of Tullianum. No remains of this period have been found. The city was small under the Numidian kings. Setifis (or Sitifis) was founded by the Romans, during the reign of Nerva (AD 96 to 98), as a colony for veterans. Although no buildings of this period are known, a cemetery excavated in the 1960s seems to have contained tombs from the early colony. The Romans built a circus at Sitifis, which aerial photographs show survived substantially intact until the 20th century; today only a small part of the curved end continues visible; the remainder has been destroyed or built over. As the town grew, around 297AD, the province of Mauretania Sitifensis was established, with Sitifis as its capital. When Mauretania Sitifensis was created, at the close of the 3rd century, Sitifis became its capital. In the newly prosperous town a bath building was built, decorated with fine mosaics: its restoration in the fifth century had a cold room (frigidarium) paved with a large mosaic showing the birth of Venus. On the northwest edge of the town two great Christian basilicas were built at the end of the fourth century, decorated, again, with splendid mosaics, and a Bishopric was founded at this time. There was a Jewish community in the area. In the 5th century it suffered from a violent earthquake. Although we do not know what happened under Vandal rule, the Byzantine conquest brought with it a major fort, of which parts are still standing. The city was the base of a Bishopric. Augustine, who had frequent relations with Sitifis, tells us that in his day the Bishopric had a monastery and an episcopal school. Several Christian inscriptions have been found there, one of 452 mentioning the relics of Saint Lawrence, another naming two martyrs of Sitifis, Justus and Decurius. Optatus, at the Council of Carthage (525). In 647 AD (the year 27 of the Hegira), the first Muslim expedition to Africa took place. By 700 AD, the area had been conquered and converted to the Islamic faith. We know little of the early Islamic town, but by the tenth century the area outside of the fortress was once more filled with houses: on the site of the Roman baths over twelve of these were excavated, with large courtyards surrounded by long, thin, rooms. After conquering Cairo, the Fatimids abandoned Tunisia and parts of eastern Algeria to the local Zirids (972–1148). The invasion of Ifriqiya by the Banu Hilal, a warlike Arab tribes encouraged by the Fatimids of Egypt to seize North Africa, sent the region's urban and economic life into further decline. Similar to an army of locusts, they destroy everything in their path. In the mid-eleventh century this development stopped abruptly, and a defensive wall was built around the city. Nothing more is known of Sétif until the ruins of the town were used by the French army, who built their own fortress on the site in 1848, using the line of the medieval city wall and the Byzantine fortress. On 8 May 1945, the day of the formal end of World War II in Europe, an uprising against the occupying French forces in Sétif and the nearby towns Guelma and Kherrata resulted in the deaths of 104 pieds-noirs. The uprising was suppressed through what is now known as the Sétif massacre. Estimates of Algerian casualties vary widely from 2,000 to 40,000 (see Setif massacre for details). The local economy deals both with trade and industries. The trade is mainly in grain and livestock from the surrounding region. Locally produced wheat is processed by local factories to produce semolina, couscous and noodles. Other industries are woodworking, manufacture of carpets and metal handicrafts. Zinc is extracted from nearby deposits and there are hydroelectric development to the north. It has become the commercial center of a region where textiles are made, phosphates are mined and cereals grown. A large amusement park is located in the center of the city where the city Zoo can be found. Sétif has a Dry Mediterranean climate (Köppen climate classification BSk), its summers are hot and dry, whilst its winters are cool and somewhat moist. Due to Sétif’s location on the High Plateaus at an elevation of 1,096 metres (3,596 ft), it is one of the coldest regions during winter in Algeria. The Wilayah frequently sees an annual snowfall of up to 40 centimetres (16 in). Flash floods are rare but have recently occurred around the spring and fall seasons. The summer is fairly hot where extreme heat waves are common around the month of July where temperatures can sometimes even reach 40 °C (104 °F). The ES Sétif Soccer Team is one of Algeria's most prestigious top division clubs.